Home / celeb / game of thrones / HBO / news / Brutal! This is how “Game of Thrones” actors discover they're going to die! Brutal! This is how “Game of Thrones” actors discover they're going to die! Those who watch “Game Of Thrones” already know that the characters of the fantasy drama series often drop dead like flies, sometimes even without a moment's notice! You'd think that only fans of "Game Of Thrones" are subjected to the stress of discovering if their favourite character is to be killed off, but young actor Isaac Hempstead-Wright who plays Bran Stark on the popular HBO series, says that the cast feels the same too until they eventually find out for sure! "The first sign would be a bottle of champagne and a bouquet of flowers from the producers delivered to the actor's dressing room. And you'd think, Oh that's nice of them." "Then shortly would come the dreaded phone call from them saying that you're being killed off." Said Isaac when TheHive.Asia met him in Singapore recently for the promotional event of "The Game of Thrones Experience: Worlds of Westeros" exhibition. The 17-year-old actor was also in town to talk about his return in the upcoming season as he was noticeably absent from the entire fifth season of the series. David Benioff and D. B. Weiss are the producers of the long running "Game of Thrones" and the actor said he nearly fell off his seat when they called him before the start of season five. "I got a call for in the morning from my agent saying that the producers wanted to talk to me on the phone. And I thought, "Oh no, it's over!" And I spent the whole day just thinking about that. They then called me and said "oh we just want you to sit out this season"." 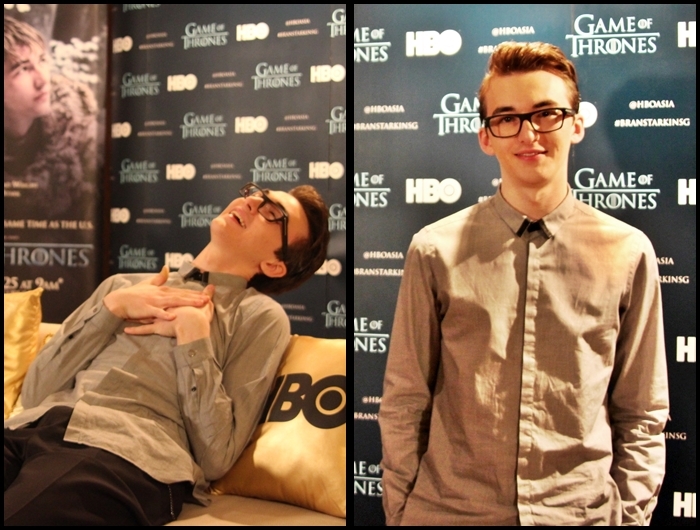 Isaac Hempstead-Wright pretending to get killed off (left) and posing for reporters (right). In the upcoming season six, Isaac reprises his role as Bran Stark and is said to play a major part in the plot as he has honed his prophetic abilities known as 'greensight'. At the end of season five, one of the show's lead actors and fan favourite, Jon Snow, played by actor Kit Harrington was shockingly stabbed to death. However as the episode abruptly ended right after the crucial scene, the subject of his death has been much debated about and there are some theories supporting the return of Jon Snow one way or another in the upcoming season 6. As of season five, there have been 61 recorded deaths of major characters (not including soldiers, villagers and minor characters). 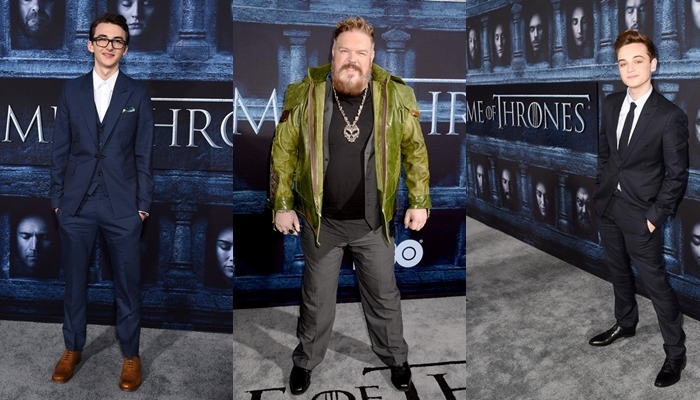 Anyway, the premiere event of "Game of Thrones" was just held in Los Angeles recently. 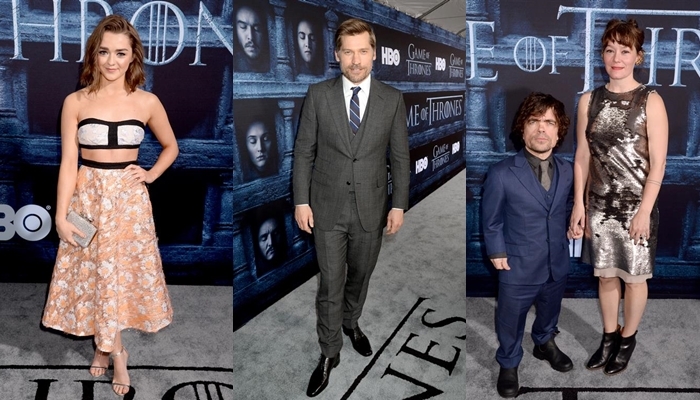 Check out photos of the cast (without Kit Harrington) below! 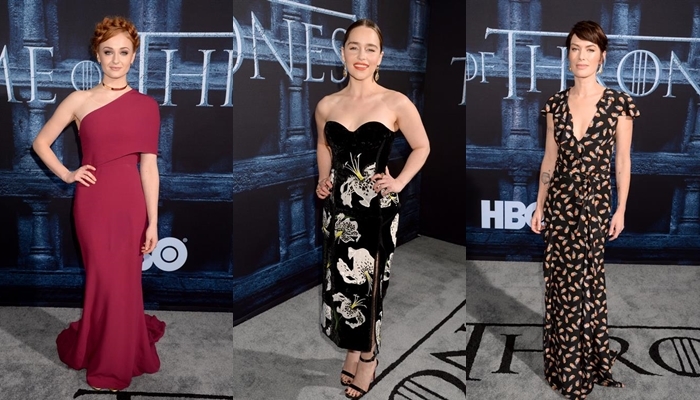 (L-R): Sophie Turner, Emilia Clarke and Lena Headey. (L-R): Maisie Williams, Nikolaj Coster-Waldau, Peter Dinklage and Erica Schmidt (wife). (L-R): Iwan Rheon, Aiden Gillen and Finn Jones. (L-R): Isaac Hempstead-Wright, Kristian Nairn and Dean-Charles Chapman. Not only that, there's also a new trailer released which gives us more glimpses into season 6. To watch it, click HERE. "Game of Thrones" returns for its ten-episode sixth season in Asia the same time as the U.S. – exclusively on HBO (Astro Ch 411 / 431) this April 25 at 9am, with a same day encore at 9pm.